Andy takes a short break from work to marry his fiancé Janet (Lisa Howard) but delays their honeymoon so he can concentrate on making sure his first murder case is a successful one. Then ... After the ceremony they take a day off. Driving through town, they pay no heed to the stop signal ahead. Check out that fine-looking church on the left. ...and Now, they are driving south down Gough Street, approaching Eddy (map). But today the church, St. Paulus' German Evangelican Lutheran, is gone, having burned to the ground in 1995. Note too that this stretch of Gough is now one-way. Then ... Unfortunately for the blissfully unaware newlyweds a cop witnesses the careless driving and pulls them over. 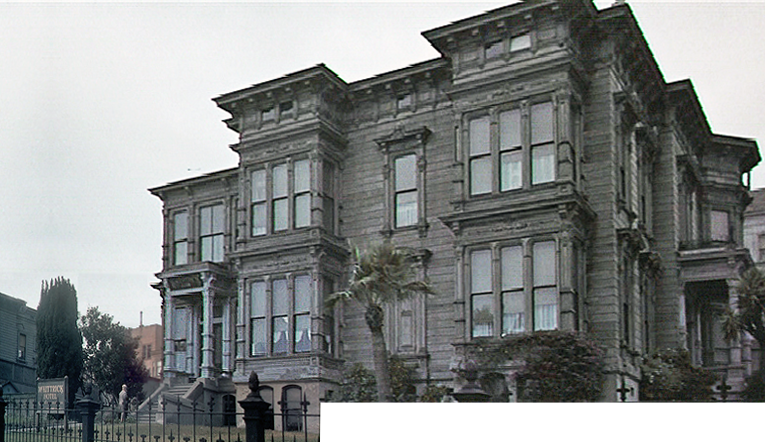 This view, looking back up Gough to Eddy, captures on the left an imposing Victorian, the Henry J Fortmann mansion at 1007 Gough, destined to be famously featured eight years later in the movie Vertigo. ...and Now, hard to see for the trees from this angle but the Fortmann mansion is no longer there. It was slated to be one of the first buildings demolished in the 1950s/60s Fillmore Redevelopment project but suffered a major fire before then. 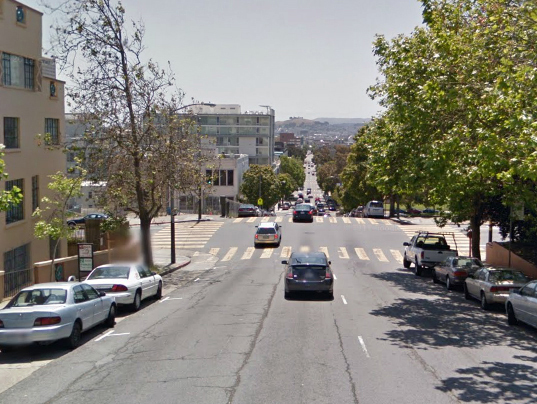 As you can see, the block across Gough on the right was spared. 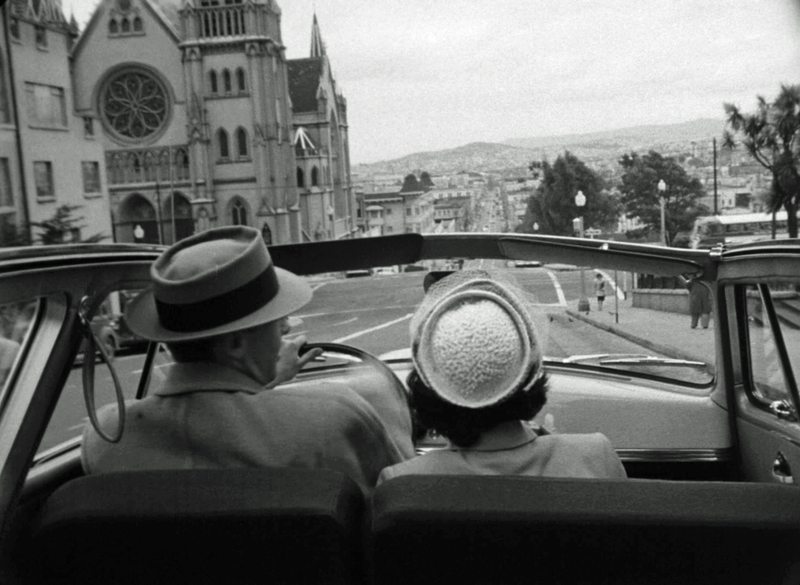 ... from Vertigo, 1958 ... The mansion became the McKittrick Hotel in Vertigo from whence Kim Novak's entranced character Madeleine mysteriously disappeared. 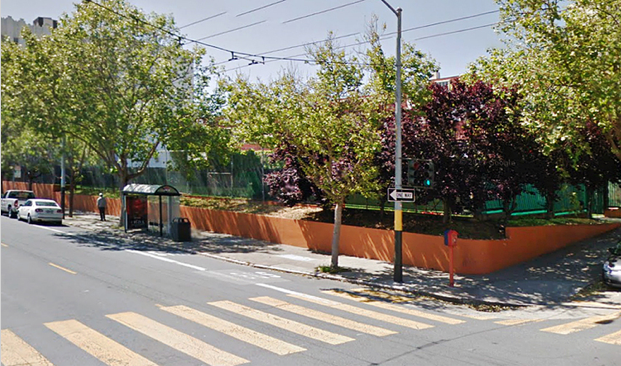 ...and Now, this corner lot became a school sports field. Then ... 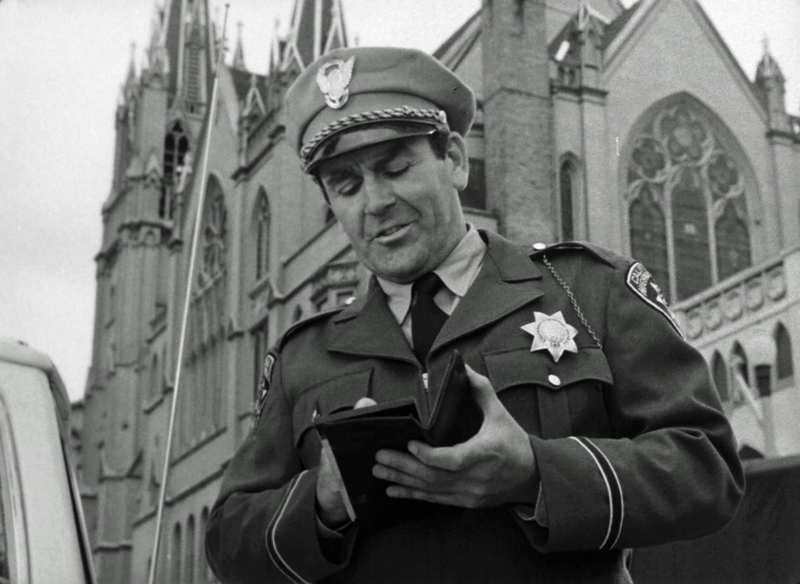 The cop starts to write a ticket then recognizes Andy as a fellow member of the police force and lets him off. This dramatic perspective of St. Paulus church must have made a lasting impression on Hollywood director Alfred Hitchcock as we shall shortly see. ...and Now, since the 1995 fire the church site has remained an empty lot, currently being used as a community garden. The Alfred Hitchcock connection? 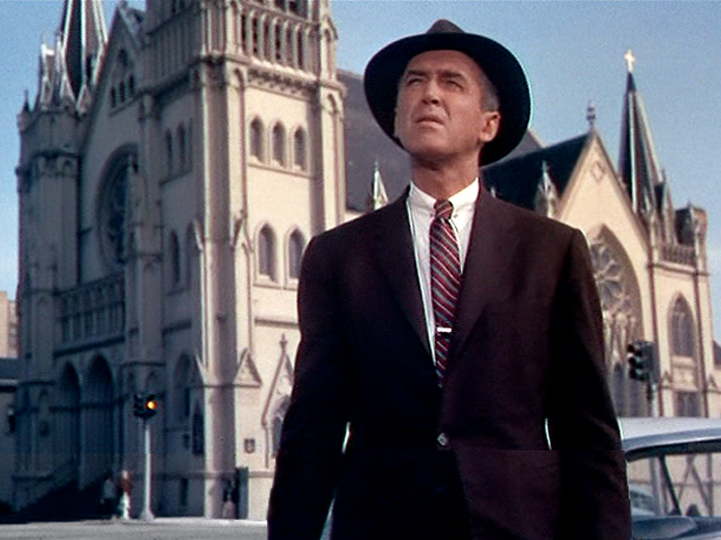 Well, here's Jimmy Stewart's character Scottie years later in Vertigo in a copy-cat perspective with St. Paulus church behind him. And sadly, the demise of the church on November 5, 1995. Following their reprieve Andy and Janet make a right turn and head west along Turk Street to spend a day at Seal Rock before he gets back on the case. St. Paulus church on Gough is across Jefferson Square Park in the distance behind them. ... a vintage photo ... this wonderful photo from Shorpy.com taken on Turk Street at Jefferson Square park of an elegant lady in an equally elegant 1923 Packard Phaeton Sports 126 captures in the left background the Fortmann mansion and at far right behind the trees the ill-fated St Paulus church.